“There is no silver bullet in our work, but there is a silver thread: this thread must be the voices of women and girls,” stated IDLO’s Director-General, Irene Khan, at the 20th anniversary celebration of Enabel, Belgium’s development cooperation agency. 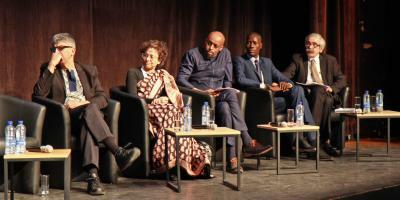 The event was convened in Brussels to discuss the future of international development with high-level actors. Among the 400 attendees were Queen Mathilde of Belgium, Prime Minister Charles Michel, and the Deputy Prime Minister and Minister of Finance and Development Cooperation Alexander de Croo. Looking ahead 20 years, the panelists acknowledged the changing landscape of international development cooperation. Instead of the traditional transfer of financial resources, a myriad of dynamic partnerships will have emerged by 2040 between governments, academia, civil society and the private sector. At the same time, many of today’s world challenges will still need to be addressed. Fragility, irregular migration and poverty will continue to plague societies, stemming from a lack of economic opportunities and a lack of human dignity. IDLO’s Director-General Irene Khan noted that one of the most persistent lingering challenges is gender discrimination and advocated for the voices of women and girls to be prevalent when building new paradigms of international cooperation. “Development achieved is not development sustained. The progress we’ve had with women is fragile and can be set back,” she urged. As global trends emerge and evolve, new challenges will only present even bigger obstacles to gender equality and women’s empowerment. Panelists highlighted the need to strengthen the rule of law, uphold human rights, and also invest in innovative solutions. “Development tends to focus wellbeing and the removal of deprivation. We need development to really focus on rights, justice, empowerment, and collective action,” Director-General Khan concluded. “This century is for women and girls."